VoIP Spear is a monitoring service. We track your voice quality and alert you when there's a problem. Be the first to know when your call quality is poor. Hundreds of companies trust VoIP Spear to monitor VoIP quality. Hang up and Try again! Call quality problems always seem to occur at the worst times. It's frustrating to ask "can you hear me?" or "can you say that again?" over and over. The VoIP service provider blames the ISP and the ISP blames the service provider. The fact is, call quality issues are intermittent so the problem is usually fixed by the time tech support looks at it. Call quality issues are intermittent, meaning that it's often the case they're no longer occurring by the time tech support gets involved. 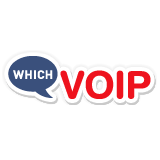 VoIP Spear monitors your VoIP quality all day, every day. Even when you're sleeping, VoIP Spear is there for you. VoIP Spear provides you a numerical score for your voice quality ranging from bad (1) to perfect (5). This is called MOS, Mean Opinion Score, and it's an industry standard for measuring voice quality. Our customers look at their VoIP quality using our charts which track MOS over time. VoIP Spear has servers in more than 15 major cities all over the world so you can test your VoIP most effectively. Our servers are located in North America, South America, Europe, and the Asia/Pacific region. 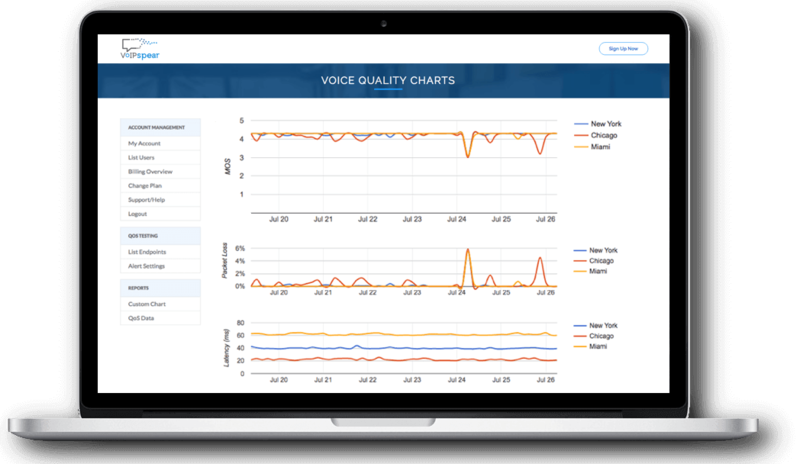 VoIP Spear monitors your voice quality and alerts you when there's a problem. Be the first to know about call quality issues. 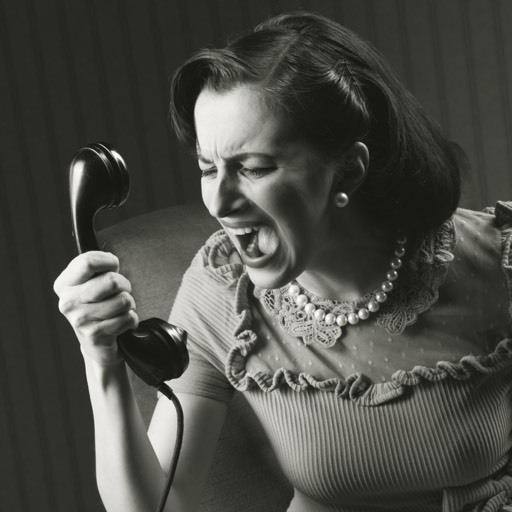 Don't wait to for complaints from customers or people on the other end of the phone. 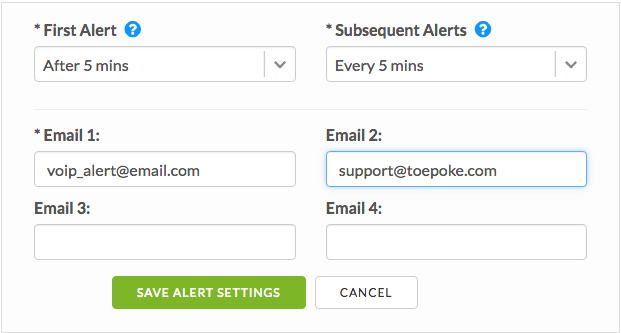 Customizable alerts give you complete control over who gets notified and how often. Ready to Try VoIP Spear? This has got to be the best tool ever for monitoring VoIP networks - brilliantly simple and effective. VoIP Spear helps Fonality deliver a higher level of service for our customers by allowing us to proactively monitor and detect customer network issues. VoIP Spear is a great troubleshooting tool that is simple to set up yet delivers powerful data on the quality of internet in easy to understand graphs. 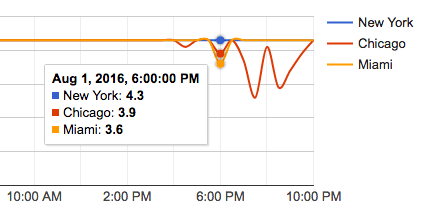 The graphs are great to show customers while the raw data is integral for our technicians to troubleshoot. We love VoIP Spear! Just wanted to give you folks a heads up. Your product is excellent. VoIP Spear can be the eyes in the sky for your VoIP service. They can identify an error or lack of call quality ... Businesses of any size can benefit from having VoIP Spear. Finally, a tool to help with my efforts to track down poor call quality! Your data allowed me just enough visibility to identify the problem. An effective VoIP service is one that can be quickly diagnosed, and VoIP Spear provides the best tools for monitoring and diagnosing VoIP services. I saw the service. Very cool and I am fairly certain it will be very popular. We are finding your product very useful and appreciate that you have created this great tool. Thank you. Larry Weiss Atlantic Computer Group, Inc. Your service is invaluable. I love your service and gladly pay for it. It is awesome when arguing with ISPs especially. ... a great little service created by Toepoke Software. It’s a great tool for acquiring remote MOS data. Erik Lagerway VoIP Quality of Service for Small Business-- Where is it? VoIP Spear was a real help. I already added VoIPspear.com to my list by recommending to a client. I suggested he first assess what QoS experience is provided by his own internet connection.